Arthritis in dogs is, unfortunately, a common condition, just as it is with humans. Although our four-legged friends can’t tell us that they’re suffering, it is usually easy to spot a dog experiencing the pain and stiffness that typically signal arthritis. But what actually is arthritis, what causes it, and how can we treat it? Read on to find out all about this painful condition and how it affects our canine companions. 1 A Dog in Pain: What is Arthritis in Dogs? 1.2 What does Severe Arthritis look like? 6.1 What is Glucosamine for Dogs? 6.2 What is the Purpose of Glucosamine Chondroitin for Dogs? 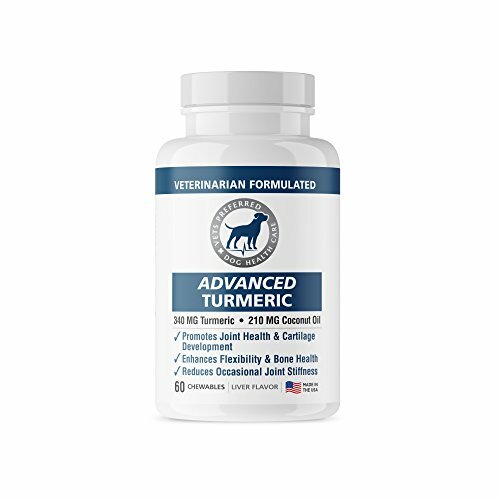 6.4 Why is Turmeric added to Joint Supplements for Dogs? 9.1 Can arthritis meds for dogs completely cure my dog? 9.2 How do I select the best dog joint supplements? 9.3 How do I know if my dog is in pain? 9.4 Do natural anti-inflammatory for dogs work? 9.5 Can arthritis in older dogs be treated? A Dog in Pain: What is Arthritis in Dogs? Arthritis simply means “inflammation of the joints”. There are a number of different kinds of arthritis, which have different causes. In healthy joints, the area where the bones meet is covered in a thin layer of smooth cartilage that is lubricated by joint fluid, known as synovial fluid. This combination allows the bones to glide together smoothly and without friction. Think of it like a well-oiled piece of machinery. However, in joints affected by arthritis, the cartilage breaks down, becoming thin or damaged. As a result, the bones begin to rub together, both causing discomfort and exacerbating the break-down of the cartilage. This is like a piece of machinery that is rusty and needs oiling, so the different parts rub together with a screech. Arthritis is a very painful condition, and can significantly reduce your dog’s quality of life, especially if it is left unmanaged. It causes mild to severe joint pain, as well as inflammation and reduced movement. What does Severe Arthritis look like? In more severe cases of arthritis, new bone can begin to form around the joint, inhibiting movement and adding further pain. In some very severe cases, dogs can even lose the ability to walk. Severe arthritis in dogs is usually treated with joint surgery, when possible. The most common areas for dogs to get arthritis are the hips and elbows. Some dogs will also get it in their ankle joints. Although older dogs are more likely to suffer from arthritis, and some breeds are more prone to it than others, it’s never too early to start promoting good joint health for your dog. A healthy and balanced diet, maintaining an ideal weight, and frequent, breed-appropriate exercise all help to keep your dog’s joints healthy. Some owners also opt to feed their dogs joint-health supplements—more on them below. As in humans, arthritis is most common in older dogs, and is just a result of growing older. However, it can also be seen in younger dogs, usually in connection with another condition or an injury. Ligament damage, for example, can alter the way a dog moves that joint, resulting in abnormal joint movement and eventually arthritis. For this reason, it is important to consult your veterinarian if you think your pet has been injured, or if you notice it walking, running, or standing differently from normal. The most well-known type of arthritis in dogs is osteoarthritis, also known as degenerative joint disease (DJD). “Osteo” means related to bones, and osteoarthritis is a progressive, long-term deterioration of the bone cartilage, resulting in pain and inflammation. In many cases, the causes of osteoarthritis are unknown; this is called primary degenerative joint disease. In some cases, there can be known contributing factors, in which case it is known as secondary degenerative joint disease. These factors can include trauma, hip dysplasia, elbow dysplasia, abnormal development of the joints, genetic conditions, obesity, prolonged steroid use, and diabetes. Septic arthritis in dogs is caused by a bacterial or fungal infection of the joint fluid. In most cases, septic arthritis will only affect one of the dog’s joints, though the infection can spread to other joints. This type of arthritis is most common in middle-aged dogs of 4 to 7 years and is especially seen in Labradors, Dobermans, and German Shepherds. Immune-Mediated Polyarthritis (IMPA) occurs when the body’s own immune system begins to attack the body, and specifically the joints. There are two kinds of immune-mediated polyarthritis: erosive and non-erosive. Erosive immune-mediated polyarthritis means there is a break-down of the joint’s bone and cartilage. This kind of polyarthritis is relatively rare, though it is more commonly seen in young Greyhounds. With non-erosive immune-mediated polyarthritis, there is no break-down of bone and cartilage. This is the less serious type, and luckily the more common of the two. Rheumatoid arthritis is another name for erosive immune-mediated arthritis. As dogs get older, they are more likely to develop arthritis, due to wear and tear on the body and the body’s diminishing ability to repair itself. Studies have shown that some 90% of older dogs (over eight years) will develop osteoarthritis in at least one joint. The symptoms of arthritis in dogs will differ slightly depending on what sort of arthritis they have, though there are certain common symptoms. Look out for stiffness, especially after exercise or during cold weather. Joints might be swollen, or noticeably deformed. Your pet might be walking differently, or be limping. In cases of septic arthritis or immune-mediated polyarthritis, you may also notice secondary symptoms of illness, including lethargy, fever, loss of appetite, and weight loss. The treatment of arthritis depends on which sort of arthritis your pet has. For this reason, a definitive diagnosis is first critical to beginning the right course of treatment. With septic arthritis, it is a case of treating the underlying infection, typically with a course of antibiotics. Sometimes surgery is required to clean and flush the joint. With osteoarthritis and immune-mediated polyarthritis, however, it is more a case of prevention, managing the symptoms, and reducing the progress, rather than treating the condition. There are a number of diet and lifestyle changes that can help with all of these things, in addition to medications and pain relief. In cases of severe arthritis in dogs, sometimes veterinarians will recommend surgery to remove build-ups of bone growth, or even replace the joint. The most common types of anti-inflammatory medications that vets recommend for canine arthritis are non-steroidal anti-inflammatory drugs (NSAIDs), as steroids can exacerbate the condition. However, the majority of these are only available with a prescription. The exception is aspirin, which some vets will recommend for short-term use. You should only give your dog aspirin if told to do so by your vet, however. Vitamins can help to keep dogs’ joints healthy. Vitamin E, which is a powerful antioxidant, also helps to repair cell membranes. Most commercial dog foods will contain the minimum recommended daily dose of vitamin E, but talk to your veterinarian about whether increasing your dog’s intake, either through dietary changes or supplements, could be beneficial. Most vets will use NSAIDs to treat the symptoms of arthritis pain in dogs, especially the pain associated with inflammation. Popular NSAIDs include firocoxib (Previcox), carprofen (Novox or Rimadyl), deracoxib (Deramaxx), and meloxicam (Metacam). Veterinarians may also recommend chondroprotective agents (CPAs), which do not stop the pain, but act as joint protectors, slowing the cartilage degeneration. These are often used in conjunction with NSAIDs. In addition to prescription medication, many owners of arthritic dogs swear by lifestyle and diet changes, as well as holistic medicine and supplements. These can also be combined with NSAIDs to treat the various symptoms of arthritis. Read on to learn all about the various kinds of supplements that could help manage arthritis in dogs. Glucosamine is a supplement extracted from the shells of crustaceans, and is used in people and dogs alike as a joint supplement. It is believed to help build and maintain the cartilage in our bodies. What is the Purpose of Glucosamine Chondroitin for Dogs? Glucosamine is almost always given in combination with another ingredient, chondroitin sulfate. This chemical is thought to help regulate the enzymes that damage the cartilage. The two supplements work together to combat one of the causes of cartilage deterioration, as well as maintaining and rebuilding the existing cartilage. You can buy Glucosamine Chondroitin for dogs online or in pet shops. MSM, which is short for methylsulfonylmethane, is a sulphuric compound that occurs naturally, though it can also be synthetically produced. It is used as a dietary supplement to reduce the pain associated with arthritis, as well as other chronic pain. It is also an antioxidant and has anti-inflammatory properties. MSM is available in chewable tablets specially formulated for dogs. Why is Turmeric added to Joint Supplements for Dogs? Turmeric is a spice, related to ginger, which you may be more familiar with as an ingredient in many curries. However, this bright yellow plant can also be used as a supplement for arthritic dogs. In traditional Ayurvedic medicine, turmeric is believed to have soothing and anti-inflammatory properties, perfect for sore arthritic joints. PREMIUM QUALITY - veterinarian-grade turmeric supplement for dogs to help with hip & joint mobility, muscle pain and inflammation. Now we’ve covered the most common ingredients, which are the best brands of joint supplements for canine arthritis? Let’s have a look at some of the most popular options. Tri-Acta from Integricare is a joint supplement that comes in powder form, making it easy to mix in with your dog’s food every day. 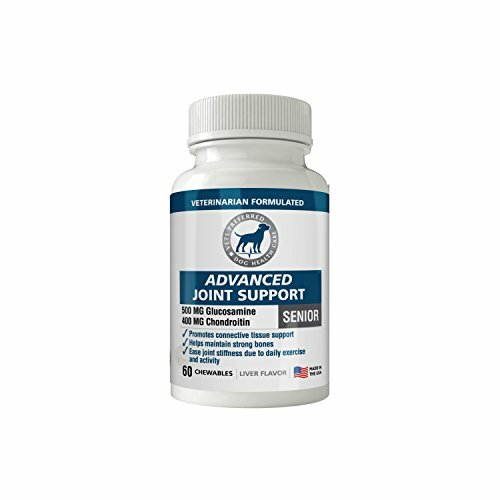 It combines Glucosamine Chondroitin with MSM to promote healthy joints and cartilage regeneration. Tri-Acta can help with arthritis in dogs, as well as hip dysplasia and age-related stiffness. The Nutramax soft chews and chewable tablets from Cosequin are joint supplements that come recommended by veterinarians. These chews contain Glucosamine Hydrochloride, Sodium Chondroitin Sulfate, MSM and Omega-3 fatty acids. Vets Preferred offer natural supplements specially formulated for puppies, adult dogs, and senior dogs. These supplements aim to keep dogs healthy by supplementing their diets with all the vitamins and minerals they need. The natural solutions include joint support, building bone density and muscle mass, and anti-inflammatories. They can both alleviate the arthritis symptoms, and help to prevent future joint problems in younger dogs. Cannabidiol, or CBD for short, is a compound found in cannabis plants that is believed to help with everything from pain, inflammation, allergies, and seizures, to stress and anxiety. Don’t worry though, CBD, which usually comes in an oil form, is completely legal in all 50 states, and won’t get your pet high! There are now a number of companies that offer CBD therapy for dogs, which many owners swear has helped their arthritic pups. Honest Paws offers bespoke packages that can combat any number of conditions, including arthritis. Their CBD is available as a straight oil, or as delicious, healthy treats. Do you have dogs with arthritis? Read on for FAQs about arthritis treatment. Can arthritis meds for dogs completely cure my dog? Unfortunately, no. Arthritis meds just manage the symptoms and help to slow the progress of canine arthritis. How do I select the best dog joint supplements? Choosing the right dog joint supplement depends on a lot of different factors, including the type, age, and size of the dog, and the kind of arthritis your pet has. If in doubt, consult your veterinarian to see what they recommend. If your dog is suffering from arthritis-related pain, you may notice them limping or walking differently. They may have difficulty moving one or more of their joints, and they may be reluctant to let you touch the affected area. You may also see a loss of appetite, listlessness and weight loss. Do natural anti-inflammatory for dogs work? Although scientific studies for most natural anti-inflammatories are inconclusive in relation to joint disease in dogs, many owners swear by them. Can arthritis in older dogs be treated? Although osteoarthritis cannot be treated, it can be managed in many cases, so your older dog can still enjoy a good quality of life! Swimming! As with humans, swimming is a great low-impact exercise that won’t put extra stress on your dog’s joints. Short, gentle walks: Taking your dog on short, gentle walks (ideally on flat, grassy surfaces) is easier on their joints than long hikes. Walking also helps to keep your dog’s weight down if it is prone to obesity. Playing Gently: Fetch (over a short distance) or a careful game of tug-of-war are gentle ways to exercise your dog and give it mental stimulation, without putting pressure on its joints. Puzzles: If your dog can’t move about as much as it once did, it may get bored cooped up inside. Try filling dog puzzles with their favorite treats, and watching them work out how to get to the prize. This mental stimulation will help to alleviate boredom.